Hey everyone how’s it going today? Today’s social media tip is about including your social media badges or logos on your marketing. You know what I’m talking about right? Those icons you have on your website e-mail and print advertising. 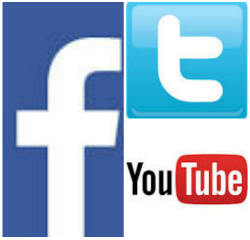 The cool Facebook, Twitter, or YouTube logo that you want proudly displayed. Since I’m all about social media every time I see a social media icon of a company I may have the opportunity to do business with I go visit their social pages. I want to see what they are all about and who their audience is. When these logos are included on your marketing material, you are telling your customers “hey check us out, cool stuff on Facebook, Twitter, and YouTube”. When including these badges in advertising material be sure the profile is complete on the social media platforms. It surprises me how often a business, product or service includes a social media logo in their advertising and when you go to the social media page it’s either nonexistent or partially complete. Let’s say you decide to mail out a post card in your area promoting a sale or special Event. If the post card includes a small image of a YouTube logo your business better have a YouTube channel. If you do not have a YouTube channel with a complete profile and a couple videos do not put the YouTube logo on your advertising. The same goes for all of your social media platforms. Facebook, Twitter whatever social site it may be. Only use the badge or logo if you are actually active on the social media platform. If you have a link in your e-mail or website with a Facebook logo and someone clicks on that logo they expect to see a complete professional looking business page. This does not mean your page needs to have a bunch of likes or followers. Your page profile needs to be complete, include information about yourself, product and business. Also be sure your page has some recent content posts. The same rule applies for all of your social media profiles and pages. It’s very important to include the social media logos in your marketing; just take the extra step to have the profile page complete that corresponds to the social media icon or logo. Do you have a phone number? Would you give someone your phone number if you did not have either yourself or a member of your staff available to answer? At the very least your voicemail would pick up. Do you have a website? The same applies. You would only include the web address in your marketing if it is functional and provides information about your product, business or service. When you give your e-mail address you know that you will be able to respond, and that your e-mail is working to receive e-mails. This may sound simple, but your social media pages need to be treated the same way. Your business, product, or service has to respond to your fans, followers, and subscribers. The first step before beginning to include social media logos in your advertising is to be sure that you are social. Take the time to complete each social media profile. Start one at a time with Facebook for example, schedule the time out of your day and complete the entire profile, review 2-3 times if you have to. Take a peek at some other Facebook profiles that are in a similar industry for some guidance. Don’t worry about being a Facebook pro just complete all profile sections, upload a picture and google a few industry related articles to post for content. Tell the story of yourself and your business. Once you have a complete Facebook Profile, then go ahead and include in your marketing material, e-mail, website, etc. Then block out some time and move on to Twitter and so on. Before you know it all your social profiles will be complete. The next time a future, current, or past client clicks on your social badges, they will know that you are social with social media. Contact us today for all your social media needs.